Palestinian Authority officials promise to continue paying 'martyrs'' salaries, claim Netanyahu is 'destroying' the Palestinian Authority. Senior officials in the Palestinian Authority (PA) promised that they would never cease paying terrorists' salaries and said Israeli Prime Minister Binyamin Netanyahu would have to pay more if the salaries were deducted from the payments to the PA.
"The Palestinian Authority will never stop paying salaries to the families of prisoners and martyrs," senior PA officials told Reshet Kan Bet. "Netanyahu is destroying the Palestinian Authority by deducting these funds from the taxes. In the end, he'll need to replace the Authority and pay all of the salaries in the [West] Bank and Gaza." 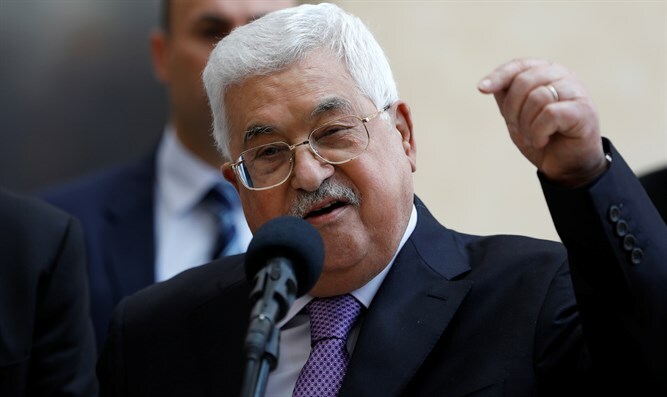 Under the new law, the Israeli government will withhold tax funds to the Palestinian Authority as long as the PA continues to pay salaries to terrorists who attack Israeli citizens. This year, the sum amounts to over NIS 1.2 billion ($328 million) in tax revenues. The law, proposed by MKs Avi Dichter (Likud) and Elazar Stern (Yesh Atid), passed in its second and third readings with a vote of 87-15. All Knesset factions except for the far-left Meretz party and the Joint Arab List supported the bill. On Tuesday, Defense Minister Avigdor Liberman (Yisrael Beytenu) founded the National Bureau for Fighting Terror with Economics, which will be responsible for implementing the law deducting terrorists' salaries from money transferred to the PA as well as coordinating Israel's economic battle against terror organizations in Israel and abroad. The Bureau will also track the financial activities of those involved in terror, both in Israel and abroad, as well as coordinate between the various government offices and security agencies and lead the economic battle against terror in the international arena. On Tuesday, Liberman said, "The war on terror is based on two pillars - security and economic - and we're working to eliminate terrorism by military means and at the same time drying up its sources of funding."